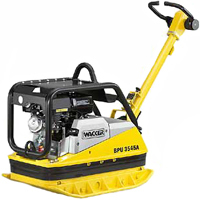 Offers compaction of various types of soil. Shows true strength when working on semi-cohesive soils. Reversible plate provides optimum performance along with a variable forward and reverse speed of up to 79 ft/min. 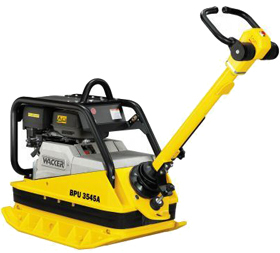 Dual shaft exciter technology provides the maximum possible compaction depth in most types of soil.. The hydraulic steering has been combined with a dead man’s handle for added operator safety. Drive Engine: Air-cooled single cylinder 4-cycle gasoline engine.